Being free is different from being secure. I once had someone tell me that jail offers the best security. Freedom offers no such thing however. People are opting for governments that are quick to offer guarantees of security, all over the world. Security costs, and that cost is creating a global debt bubble as responsibility is pushed onto governments from the people. Those governments are now going to all extremes to give people what they seemingly want: freedom from the burden of personal responsibility for their station, and a Utopian world that can’t exist on an earth where geopolitical realities rule the day. Security is not freedom, in fact it’s just the opposite. So what is Canada’s reality in the world? Are we as strong and free as we think we are or does our geography really define us and perhaps confine us? Our vast country, a country that prides itself on its confederation of dynamic provincial distinctiveness, and that is currently struggling with climate change, centralized education systems, socialism and free market capitalism, is, as all countries are, defined by its geography. 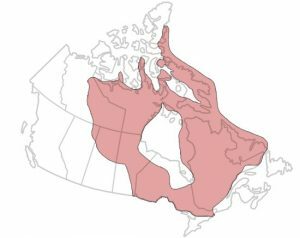 As large as Canada is, it consists of a lot of inhospitable terrain in a northern climate that is as equally inhospitable. The Canadian Shield–exposed rock with marginal soil–extends from Labrador in the east to include nearly all of Québec, much of Ontario and Manitoba, the northern portion of Saskatchewan, the northeast corner of Alberta, much of the Northwest Territories and Nunavut, and into the Arctic Archipelago. Although it is rich in minerals, coniferous forests, and has huge potential for hydroelectric projects, it inhibits settlement, which is one of the main reasons population distribution is centered along the southern border with the US. 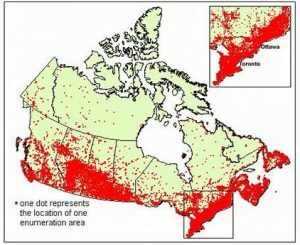 With the Prairie Provinces and some of BC being the exceptions, southern locations are still the densest population centers. Close to 1/3 of the entire population of Canada is squeezed into the Toronto, Ottawa and Montreal areas highlighted in the map below. BC has its struggles with its mountains so most of the population lives in the narrow valleys and plateaus, or the south coastal regions. The far north of Canada has extremes in weather and has more or less permanently frozen soil, eliminating agriculture. The Arctic Ocean has limited use as ice forms that blocks passage for most of the year, but if global warming continues, this may become more of a trade route coveted not only by Canada but by other competing nations. Protecting this northern route is more than Canada can afford so the US will likely respond to defend its own imperatives, bringing forward brewing sovereignty issues over our northern most territories that have traditionally beleaguered our nation. Canada is the second largest country by land mass but ranks 230th by population density at 3.4 people per square kilometre. 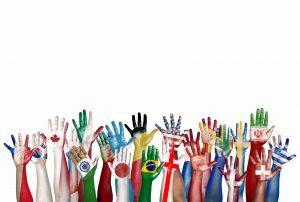 Fully 83.2% of Canadians are urbanized and it has a population of 35 million people, roughly 0.48% of the world’s population, with a medium age of 40.7 years. Canada has warm water access to both the Pacific and the Atlantic oceans but east-west trade has not been easy in the past due to a lack of major, linking water ways. This is less of a problem today but it has hindered trade in our early years, so the majority of Canada’s surplus GDP is sent south to the US. The USA is by far our largest trading partner and we have become very dependent on this relationship. Being surrounded by oceans is great protection from invaders but there are great distances to cross to access international markets, while the US is just a warm trip south with relatively unencumbered admittance. The future may be different but even so the markets provided by the largest economy in the world are very tempting and hard to overcome. The following is a list of the top 15 trading partners that Canada exports to. From a continental perspective, 77.4% of Canadian exports (by value) is delivered to its North American Free Trade Agreement (USMCA) partners, United States and Mexico. The total amount of trade with the US is a full ¾ of all exports. As the 10th largest economy on the planet living next door to the 1st largest, Canada is very vulnerable to US whims, as we have seen with the NAFTA negotiations. The present government talks tough about US negotiations, however Canada’s vulnerability is openly apparent. The US exports approximately $207 billion to Canada, which is 16% of US exports that total about $1.2 trillion USD. There is a significant disproportion but some US states are heavily dependent on Canada for trade and there is some leverage available under the right circumstances. The following are the top ten exported items. The following product groups represent the highest dollar value in Canada’s import purchases during 2017. Also shown is the percentage share each product category represents in terms of overall imports into Canada. Below are Canada’s biggest exporting companies organized by asset value. Shown within parentheses is the primary industry in which each company operates. Also shown is the change in asset value as of May 2017 compared to 2016. It is interesting to note that 50% of the biggest exporters are in the oil and gas industry. Being next door to a super power is not all bad, our problems will tend to be their problems but the reverse is also true. In times of war we are likely to receive the full weight of the US military if an invasion was to happen, as unlikely as that seems, but we will also be expected to put our military into play in most US conflicts, at least to some degree. 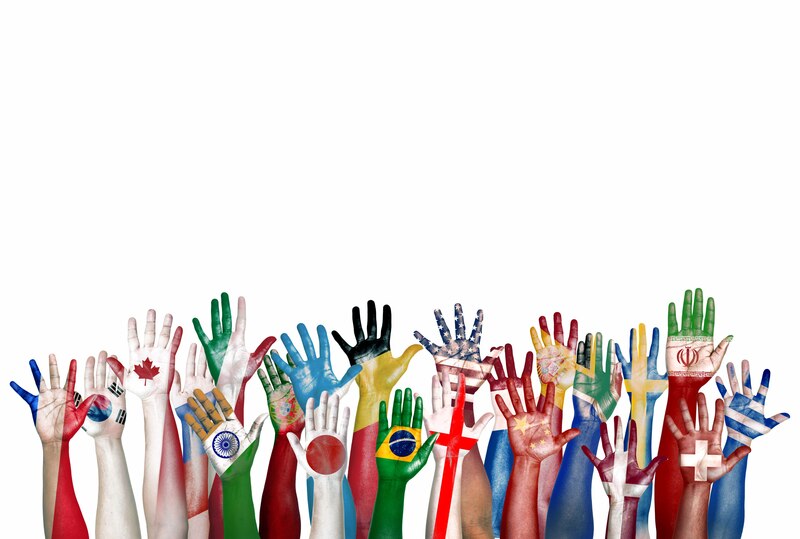 Canada is a mix of peoples and ethnic diversity from all over the globe. Our miscellany has been a model for the world. Canada’s confederation of provinces and territories also spans multitudes of diverse industries because of its geography and latitude. As Canadians we are proud of our acceptance of each other’s differences but we are also proud of what we have accomplished as a nation. And like any proud parent we can be protective if threatened. The geographic difficulties of our land has made us true pioneers. We are innovators out of necessity and entrepreneurs out of our struggle for existence. It has also made compromises a mandatory component of negotiations, but we are seeing this factor being used as a weapon against compromise. 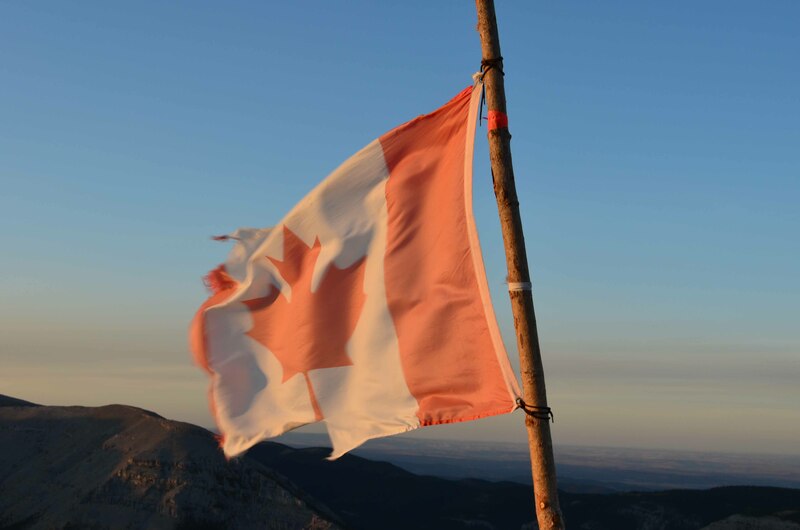 The fragile stitching of our confederation and our freedoms to move goods and services is tearing apart our identity and the trust we have in a nation built of co-operation. As has the rest of the developed world, we have entered a winter season brought about by a larger business cycle that has been ruled by a post WWII baby boom that is showing its age in the form of a decrease in spending. A good leading indicator of slowing economies is the sale of new cars. GM’s recent announcement of factory closures along with declining car sales in China portends the trend. At the end of these generational business cycles we typically see a lowering of interest rates and a corresponding rise in debt. A recent paper titled “Principles for Navigating Big Debt Crises” By Ray Dalio found that these characteristics of recession or depression are more or less always true. One may argue that the raising of interest rates and the easing of financial stimulus is a sign of strength but that may be true for the US but is Canada in the same position? Like all developed countries, Canada’s response to the 2008 financial crisis was to provide liquidity by lowering interest rates and stimulating the economy by injecting cash through capital projects. Canada however did not deleverage like most other countries did as our banks were not as affected, and our economy bounced back with hardly a hiccup once other markets began to recover. Because we basically missed the opportunity to correct our housing bubble it has continued to build. Along with mortgage debt there is personal debt and government debt that has continued to grow as well. According to a Global News article, the average Canadian owes $1.72 for every dollar earned. 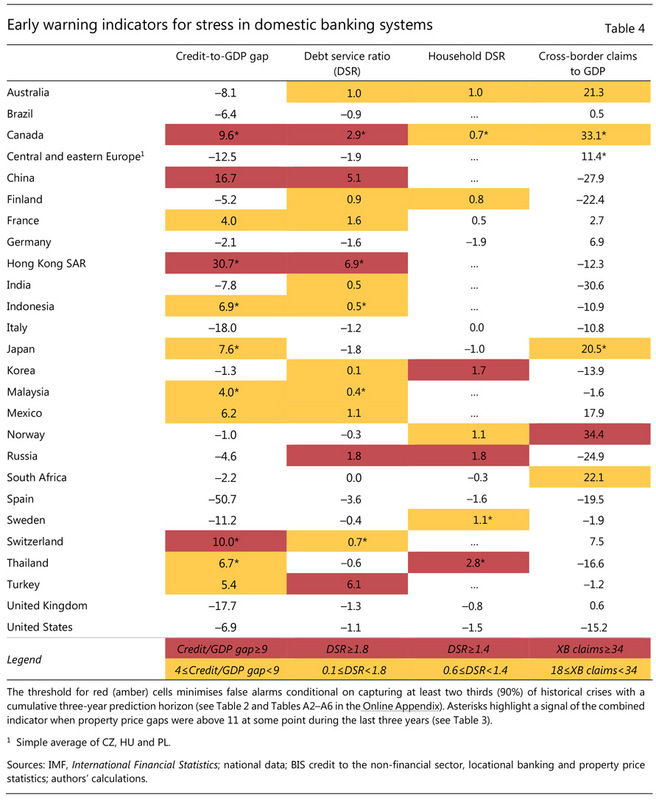 The Bank of International Settlements (BIS) has posted a warning about Canada’s indebtedness listing all four early warning indicators as being in the range of danger, with two orange and two red–the two highest warning indicators in their study. No other country is in this position. As the US Federal Reserve ups interest rates, so too must Canada follow or it will cause a decline in the value of our dollar. However if the Canadian Central Bank increases interest rates, the ability of Canadians to pay off their debt, or even to carry their debt burden, becomes harder and harder. Canadians may be free for now, but a growing debt crisis that the BIS has flagged as a potential banking crisis has the potential to chain Canadians to their payment schedules. By infighting over what our 0.48 percentage of the world’s population may contribute to global warming, which has been expressing itself in anti-pipeline and environmental protests, we have effectively held captive our ability to sell our largest export and thus eliminate any meaningful investment in that sector. Couple household debt with our tax and job losses in the energy sector, and soon the auto sector as well, and you have the makings for a made-in-Canada recession. Also, our geography has dictated our Canadian economy is tied at the hip to the US, which is doing just the opposite with its energy industry. As the US becomes more energy independent, and in fact an exporter of energy, it becomes less dependent on Canadian crude. If we don’t replace or at least maintain lost revenue, our energy sector will continue to contract. The US is overdue for a recession and leading indicators are not yet indicating its imminent occurrence but if and when it does come, the question will be: will our debt bubbled economy be able to withstand it, or will we succumb to our own dysfunction first? Close to 25% of our debt is carried by US financiers so any US currency appreciation along with interest rate increases will have an oversized effect on the Canadian monetary policy. Currently we are chained to our neighbour and restrained by our own idealist visionaries. Proud to a fault, we stand on guard, but increasingly unable to perform in a world that is aging and slowing. This cycle is producing a protectionist global environment that we have no control over and rubs against the grain of our identity. Our country is large and our population small and this costs in both dollars and continuity. Canada has definite socialist leanings due to its size and necessity to negotiate internally. This will put pressure on our entrepreneurial spirt and thus create divisions in a land of environmental and industrial imperatives all set up by our geography. As I sit here at my computer I’m listening to old-time rock and roll on the radio and as Super Tramp blasts out Crime of the Century and I sing along, the words of my own making start to replace those of Rick Davies. Someone just tell us, where our priorities should be! Well perhaps I’m not much of a lyricist. On another note, (pun intended), if you haven’t already heard, CINDE will be hosting their annual conference and exhibit in Edmonton in 2019, and once again it will be held at the River Cree Resort and Casino. This year IR will be the Conference Co-sponsor so we are hoping you will make some time on your calendar to attend. The dates will be June 18 to 20. The conference is an excellent opportunity to top up or begin your continuing education requirements and of course see all the latest advancements in our field. IR has an impressive lineup of vendors and we will be showcasing all their new and improved products and services. Like always we make the greatest innovators in the industry available to you. It is always our goal to give you all the best choices available.